On the morning of July 5th British ships with troops under the command of Major General William Tryon sailed into New Haven’s harbor, bringing the Revolutionary War to the Connecticut college town. A great deal of local legend has grown up around the events of that unusually hot summer day and no small figure in these stories is that of Dr. Naphtali Daggett. This Yale College professor, like a number of New Haven residents, took up arms against the British in an attempt to defend their homes against Tyron’s raid. The small resistance, numbering no more than a few hundred, had little chance against the 2,500 British regulars that advanced on their homes. The stories surrounding Naphtali Daggett ring of both bravery and academic wit. Like so many local legends the veracity of the tale is questionable but it seems there is some truth to the legend. Naphtali Daggett was born on September 8, 1727 in Attleboro, Massachusetts. He was a Yale graduate, Presbyterian minister and divinity professor at Yale. In 1766, following the resignation of Thomas Clap, Dr. Daggett was appointed President pro tempore. Dr. Daggett remained in the role for nine years, until Ezra Stiles took his place in 1777. During the summer of 1779 there were rumors circulating in New Haven of a planned British attack coming from occupied New York. 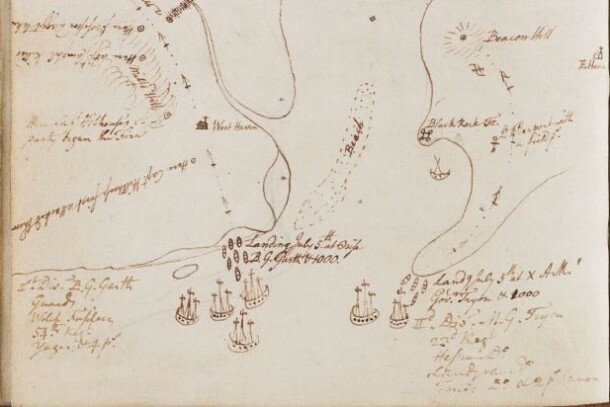 Many in New Haven hoped the British would simply pass by in favor of more tempting targets further up the coast. Stiles recorded in his diary some of the events of July 5th and from his vantage point in a steeple drew a map detailing the British invasion. A small group of fighting men were organized under Captain Hillhouse, Yale students making up a large number of the volunteers. Whether Dr. Daggett was among these volunteers is unclear, but what is clear is that he went out to fight. The legend surrounding Daggett comes from a report of his actions given by, a then Yale senior, Elizur Goodrich. At eighty-nine years old Goodrich dictated a letter to his son describing “Old Daggett” as riding past the Yale volunteers on his black mare, with his fowling piece in hand, ready to put his principles into action in a gallant and manly fashion. Goodrich related that he heard the rest only after the events. He claimed that Daggett took a position on a hill and gave battle to the whole column of British troops singlehandedly and was very efficient with his gun. The soldiers were shocked to find only a single man under cover of bushes and demanded to know why he was firing on them. He retorted with his quick wit that he was “exercising the right of war.” They asked him if they let him go if he would fire at them again, Daggett defiantly proclaimed, “nothing more likely”. This being too much for the soldiers they dragged him to the head of the column and compelled him with bayonets to show the way to New Haven. Only when he reached the green of New Haven, nearly dead from their blows and exhaustion, did they let him go. The story written down in 1849 by Goodrich’s son is compelling and others have taken it up and added their own embellishments. Osterweis, in his Three sentries of New Haven, has it that Daggett was seventy-two. Charles H. Townshed in his account says that Daggett told the soldiers that he was a minister and that he made the sincerest prayers of his life against the British. It seems unlikely that soldiers would let a man who spoke to them like that live. So, what is the truth? While some confusion does remain, Daggett swore an affidavit that was published in local newspapers just after the attack. In it he detailed the events as he experienced them. Daggett claimed that the British repeatedly shot at him and captured him after firing only one shot from his musket. He was taken, beaten badly and cut to the bone on his head and stabbed, though not deeply, by bayonets. All the while he pleaded for his life. They then stole his shoes, buckles and a few other items. The soldiers then took Daggett to an officer who questioned him and he again pleaded for his life. The soldiers then marched him at the front of a column of troops forcing Daggett to show them the way into New Haven. Beating him with a stick and insulting him saying the whole time that they would kill him on the spot. He collapsed from exhaustion and blood loss once they reached the New Haven Green. He was taken into a nearby home where he remained in bed for the next day and night. While Daggett would recover from the immediate wounds he never seemed to fully recover his health. He returned to preaching for a short time but died sixteen months later at the age of fifty-four. The story of Dr. Daggett as told by Goodrich and others is romantic and says a great deal of how people would like to remember the events of July 5th 1779. A valiant professor fighting the good fight and using his rapier wit when violence failed. The truth tells us more about the real experience of the Revolution and those who experienced it, a harsh and violent war and not the romantic war that it is so often seen as. Townshend, C. Hervey. The British Invasion of New Haven, Connecticut: Together with Some Account of Their Landing and Burning the Towns of Fairfield and Norwalk, July, 1779. publisher not identified, 1879. Sprague, William Buell. Annals of the American Pulpit; or, Commemorative Notices of Distinguished American Clergymen of Various Denominations, from the Early Settlement of the Country to the Close of the Year Eighteen Hundred and Fifty-Five. Vol. 1. New York: R. Carter and Brothers, 1866.